Situated 860 feet above the city in the Carmel neighborhood is Turó de la Rovira (pictured above). Locally referred to as the Bunkers of Carmel, this spot offers a full 360-degree panoramic view of Barcelona, including that of Sagrada Familia, Tibidabo, the MAPRE tower, the Torre Agbar and other iconic buildings. The structure was originally built in 1937 as a Spanish Civil War bunker. The area was relatively dilapidated and isolated until 2011 when, following restoration, it reopened as a heritage space. Due to the remoteness of the area, the viewpoint doesn’t get that crowded. The best time to head up to the Bunkers of Carmel is in the early evening when you can watch the sunset over Barcelona. For an inside view as unique as the one outside, make your way up to the Eclipse Bar at the W Hotel. 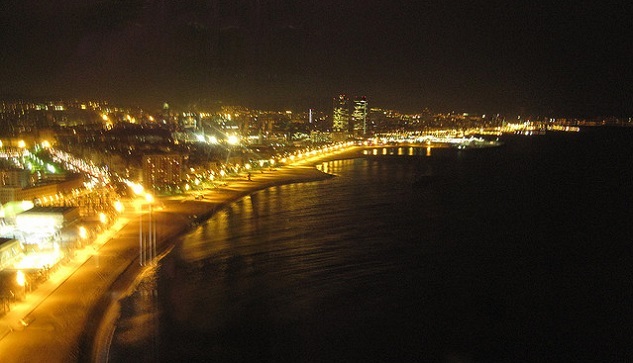 The hotel is situated next to Barceloneta Beach and has beach-meets-city vistas. The bar is on the hotel’s 26th floor rooftop and has a wraparound, glass-fronted space with floor to ceiling windows and slick interior design. The panoramic views over the city and sea span from the Collserola hills to the Mediterranean Sea. You can take in the views while seated in the luxurious and contemporary space with a watermelon martini accompanied by live performances from world class DJs. Make a reservation in advance as the bar has a strict guest-list only policy. There is also a smart dress code. 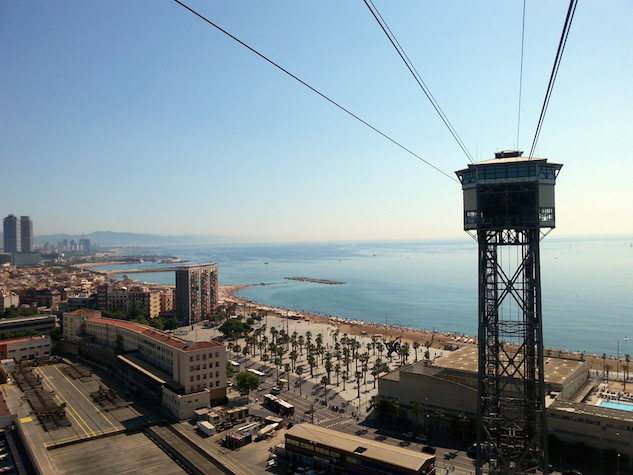 This suspended cable car offers the most mobile view of Barcelona. Three hundred and 31 feet above sea level, it travels from Barceloneta beach to the top of Montjuïc. During the 10-minute ride, you pass by the port, the harbor, the World Trade Center, Las Ramblas, the Arc de Triomf, Sagrada Familia and the Torre Agbar. Upon arrival at the Torre de Miramar in Montjuïc passengers get off at Costa i Llobera Gardens, which is the perfect place to view the harbor. This stunning building, home to the National Museum of Catalan Art (MNAC), has a roof terrace with views of Barcelona’s skyline including Sagrada Familia, the Agbar Tower and the Olympic village. Once you’re up there you can see the Magic Fountain, which is directly in front of the building. During the summer evenings, the fountains turn into a spectacular display and a kaleidoscope of color, light and music. There is a cocktail bar on the roof terrace where you can enjoy the view and the fountain show, while avoiding the hordes of tourists down below who’ve come to watch water dance to Disney music. North of the city center is Park Güell, Gaudí’s enchanting park and a World Heritage Site. The park was created in 1900 when Count Eusebi Güell bought the tree-covered hillside and hired Gaudí to make a housing estate in a natural setting. After the original idea wasn’t successful, the city bought the estate to use as a public park. Today the park is wooded with lots of intertwining pathways and all of Gaudí’s original creations including the dragon at the top of the stairs, which is covered in broken-ceramic pieces. At the top of the hillside there are stunning, panoramic views of the whole of Barcelona and the Mediterranean. 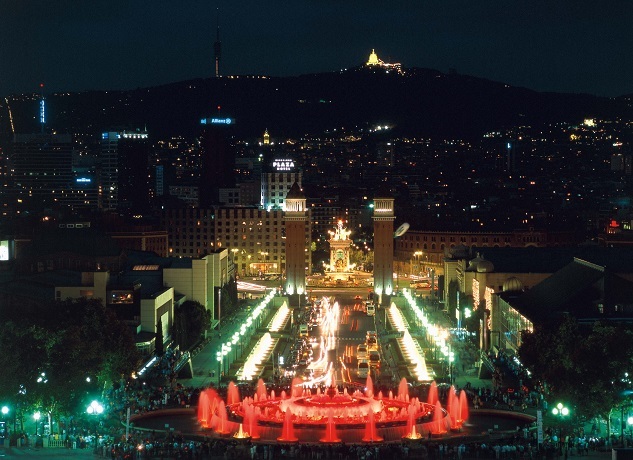 The best lookout spot is from the Turó del Calvari, the highest part of the park where you can see most of Barcelona. This entry was posted in Culture, Travel and tagged Barcelona, Barcelona arcitecture, Barcelona for free, barcelona hidden gems, Europe, Gaudi, Paste Magazine, Photography, Spain, Views by Harriet Copeman. Bookmark the permalink.